Full cost of the 5 days is £745 – reduced by 10% to £670 if you pay up front. Or pay 30% – £225 – with the balance due when you attend. As you prefer. 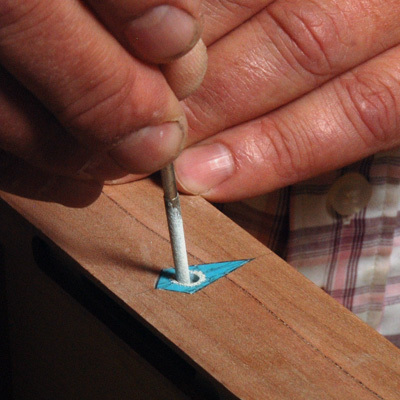 • lining throughout to completion – a fussy process that can be frustrating. Follow my simple processes for a really professional result. 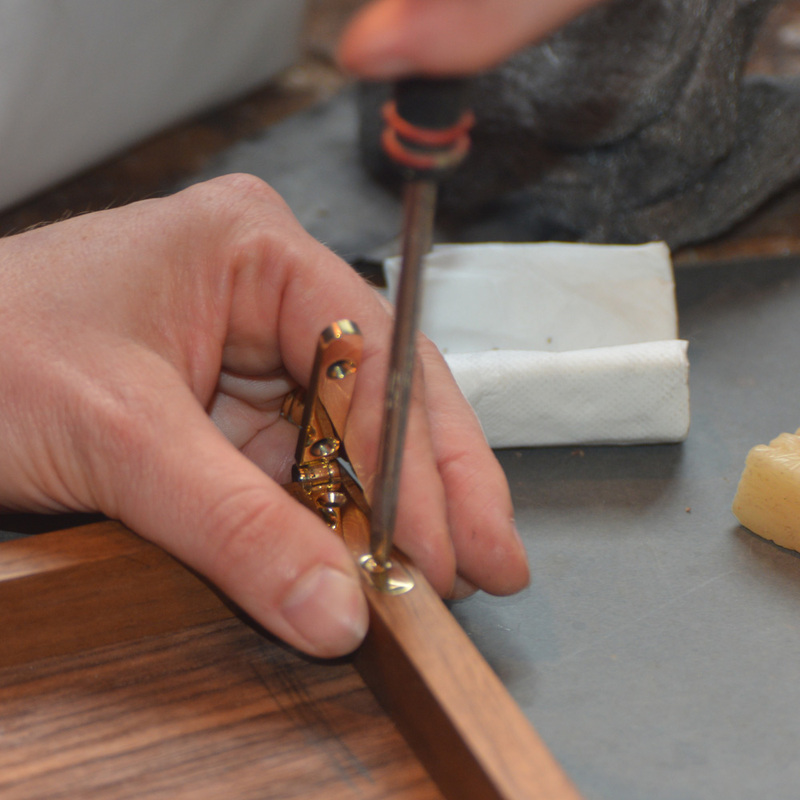 • oiling and waxing – many ways to get this wrong, I show you the right way! Click on the ‘full description’ tab above for much more info. Any queries? 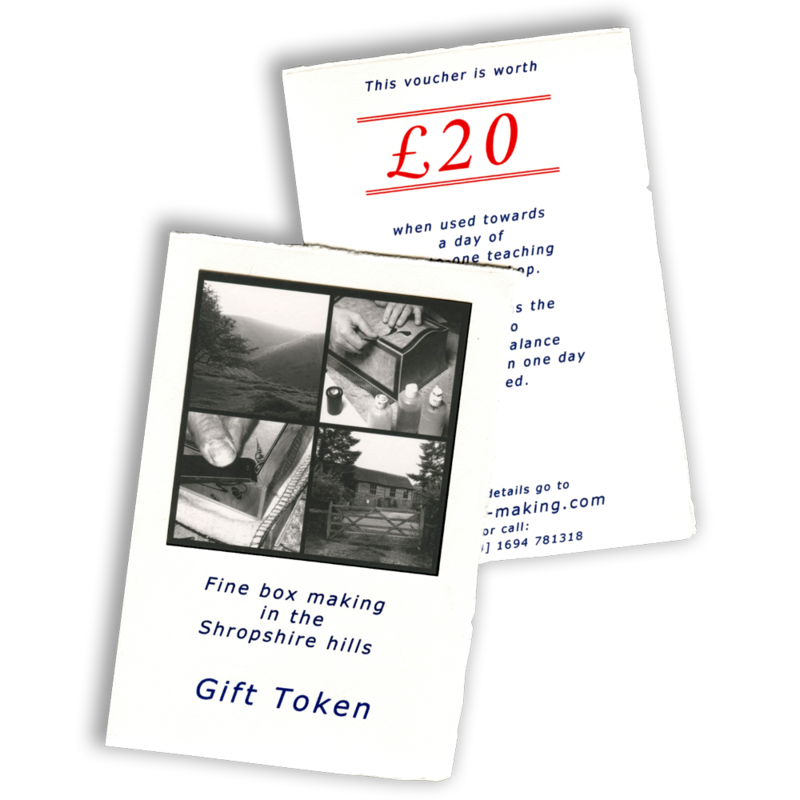 – please email me at ACfdb@fine-boxes.com or call on +44  1694 781318. 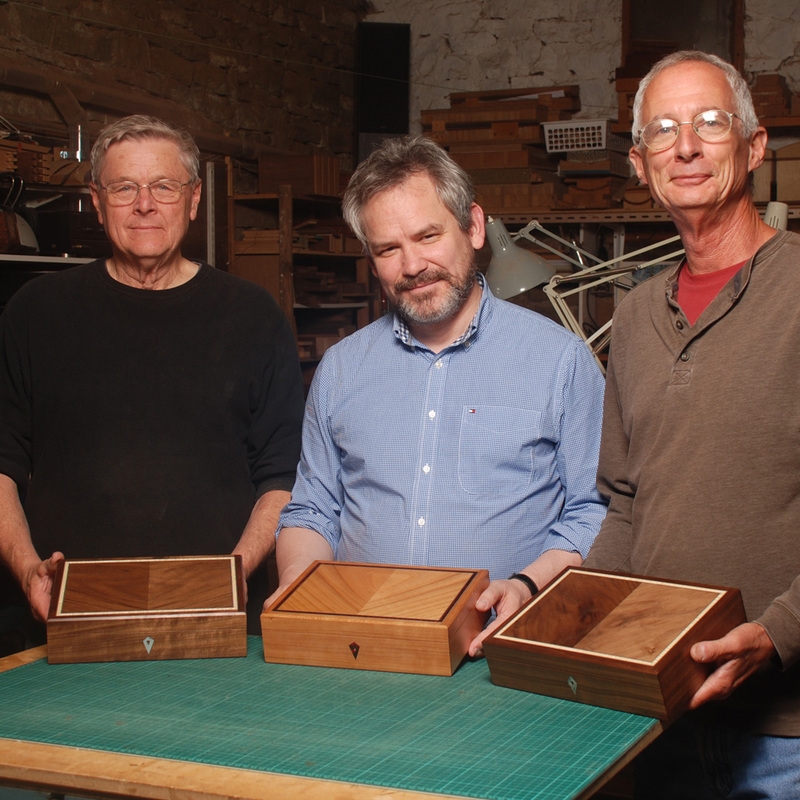 As with my weekend course the 5 day course offers a friendly and informal environment for learning some of the techniques that I regularly use to produce my boxes – and for meeting other like-minded enthusiasts. But there’s more time, of course. 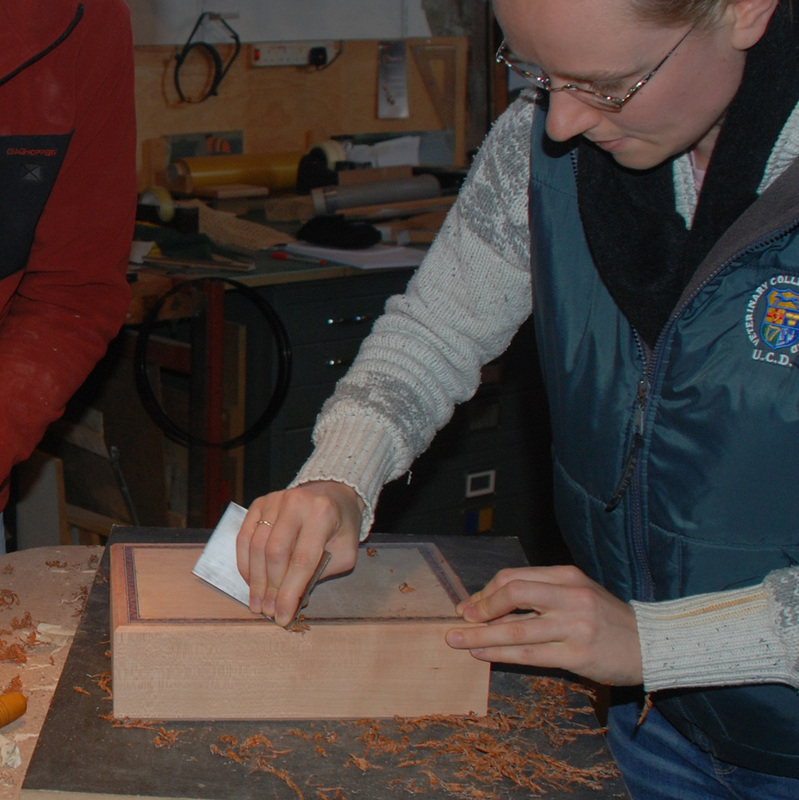 And as with the weekends the course is project-based and are for a maximum of four people – but unlike the weekend everyone goes away with a completed box. 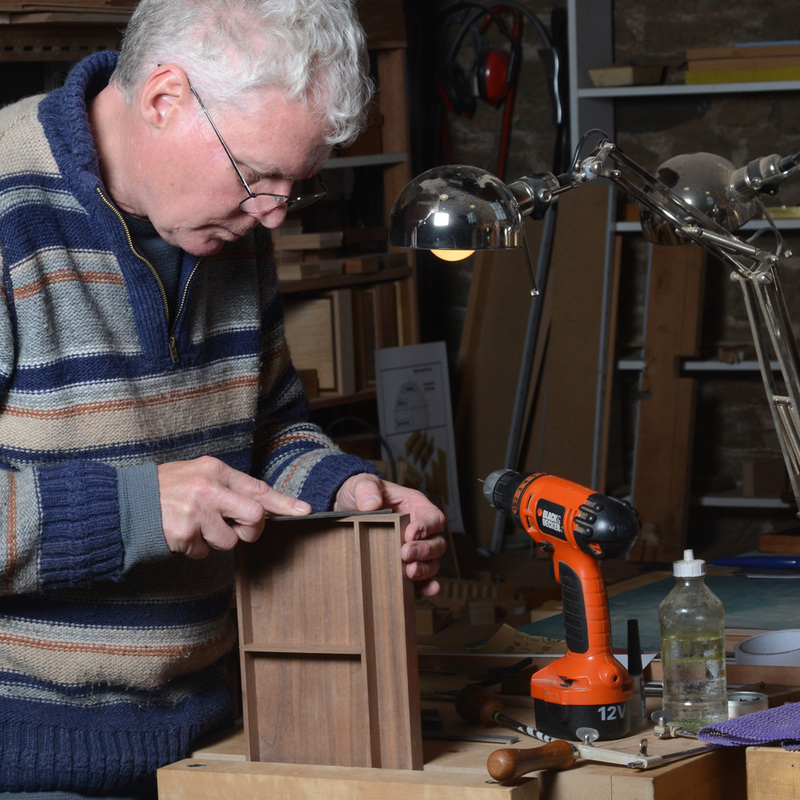 All courses are held in my workshop on the beautiful Acton Scott Estate, midway between Wenlock Edge and the Long Mynd in the South Shropshire hills AONB. If you don’t know this area, you have a great treat in store – the countryside around here is stunning! 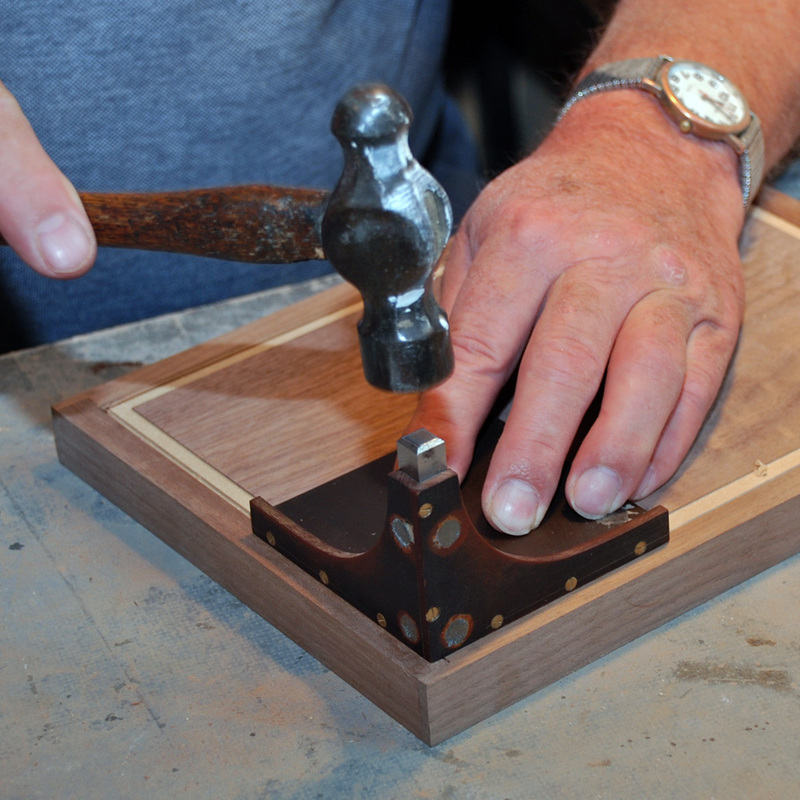 Each participant makes a simple box, approx 10” x 7” x 3” with solid sides, veneered lid and base with a decorative line inlaid around the lid. 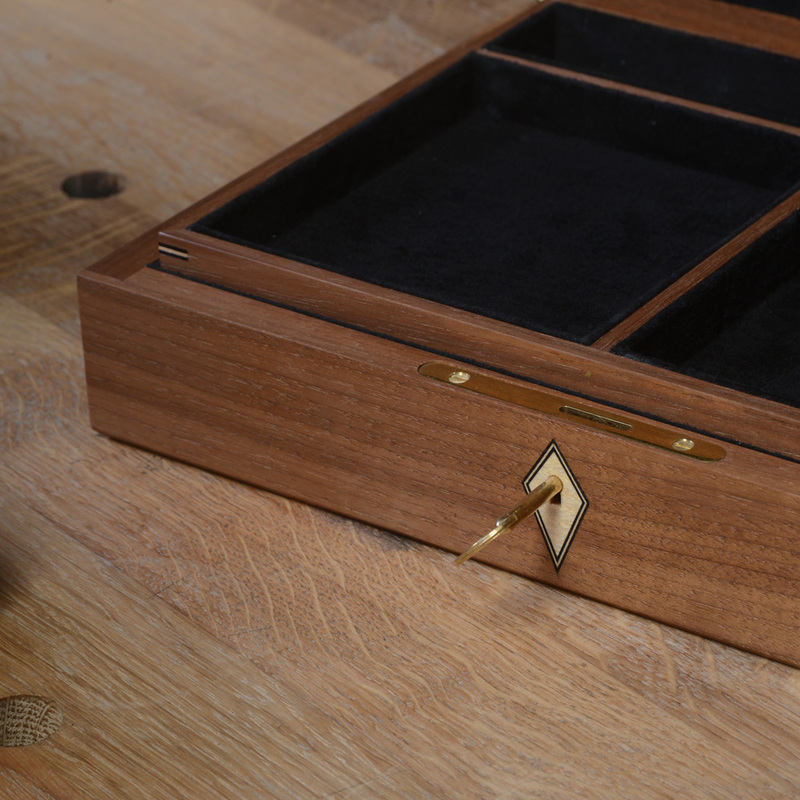 It will be fitted with smartWare – smartHinges and smartLock – have an inlaid escutcheon, beautifully cut keyhole and pig suede lined interior, including a matching tray. To save time the conversion will have already been done – these processes are covered in preparatory notes sent out before you attend. 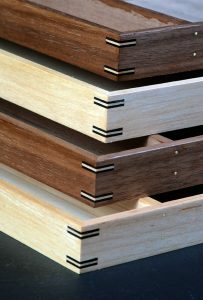 As well as these specific techniques there’s always plenty of more general chat about the design of the boxes, use of solid timber/veneer, handtools, abrasives, advice on which machines to prioritise in a small workshop, which hinges to use [admittedly a bit biased] and how to fit them, easily and quickly. And there’s usually time during the two days to have a look at any work participants have brought along. Any problems can be dealt with and queries answered. And there’s inevitably a bit of off-topic discussion, although I usually try to reserve this for the pub lunches that are always an enjoyable feature of these courses. We’re spoilt around here for excellent pubs [each pays own]. 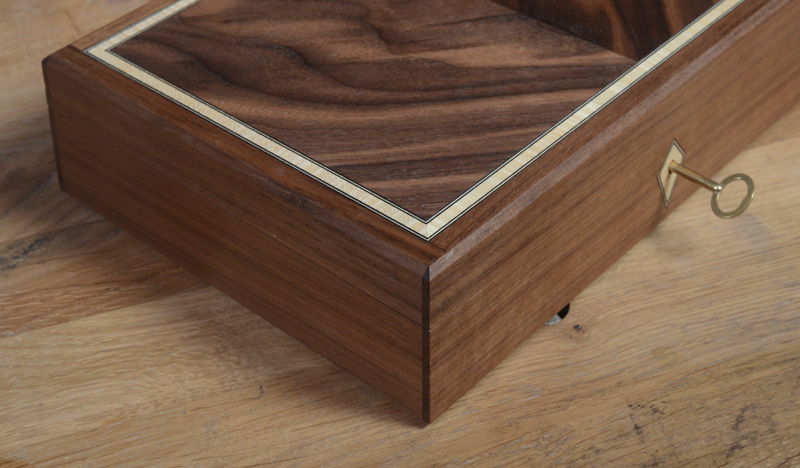 What you take home is a completed box, made from timber and veneer of your choice, inlaid with your chosen line, smartWare fitted, a matching escutcheon and keyhole lined throughout with beautiful pigsuede, with a perfectly fitting tray, beautifully finished. In addition I send out detailed notes by email with summaries of some of the key processes covered over the 5 days and I also send out a list of useful suppliers which is being added to all the time, not least by course participants! Before you attend I send out a list of things to bring, together with plenty of preparatory information. You don’t actually need to bring anything and all materials are supplied. 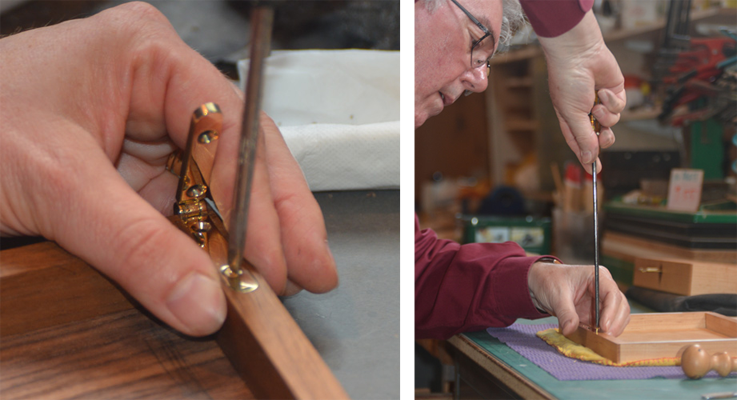 no experience is necessary – although most who attend will inevitably have had some experience in working with wood. Beginners are certainly welcome. Most of the processes I use, and teach, are what can be described as ‘de-skilled’. That is, success depends on approaching a process in a certain way, setting up the right jigs [all very simple] doing things in the right order, breaking things down into manageable chunks. I think it’s fair to say people are pleased with what they’re able to produce in 5 days! The ground that can be covered by any project based course is necessarily limited to the project in hand, although the 5 day course offers more scope for discussion, if not actual ‘doing’. 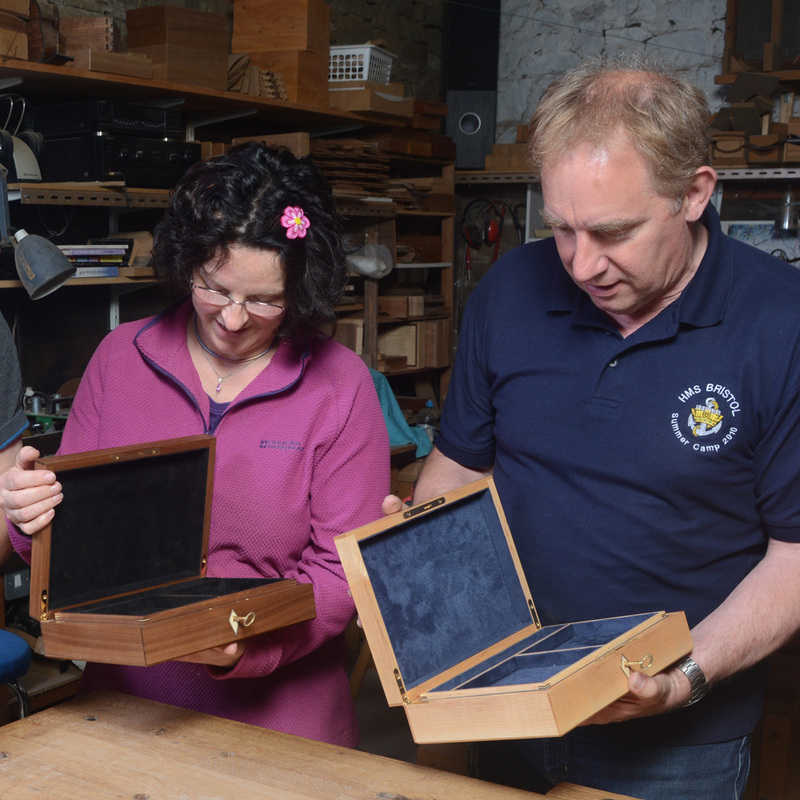 Many who attend are inspired to come and spend some one-to-one time afterwards so that certain aspects touched on during the course can be investigated in more detail. 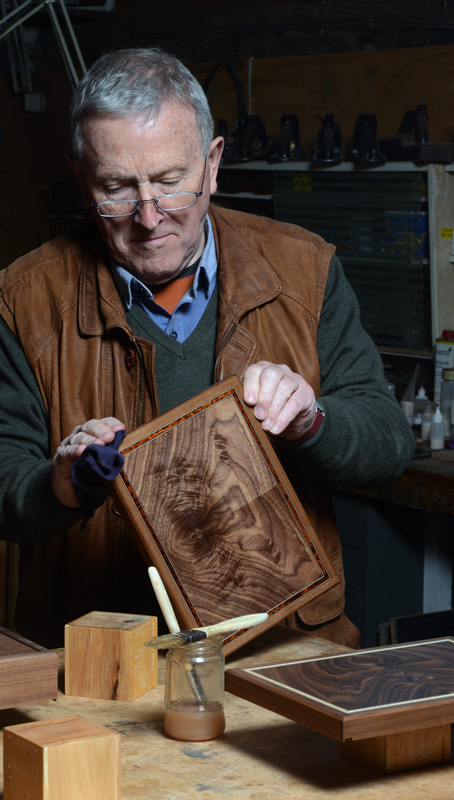 This can be making inlay lines, using burr veneers, curved-form boxes, learning french polishing, fitting complex interiors – or to make a special project from scratch.